After the medical mission, you will travel to stunning Bhutan for two days of touring, including a hike to Tiger's Nest! Tiger's Nest is a 17th Century Monastery complex with 9 temples. 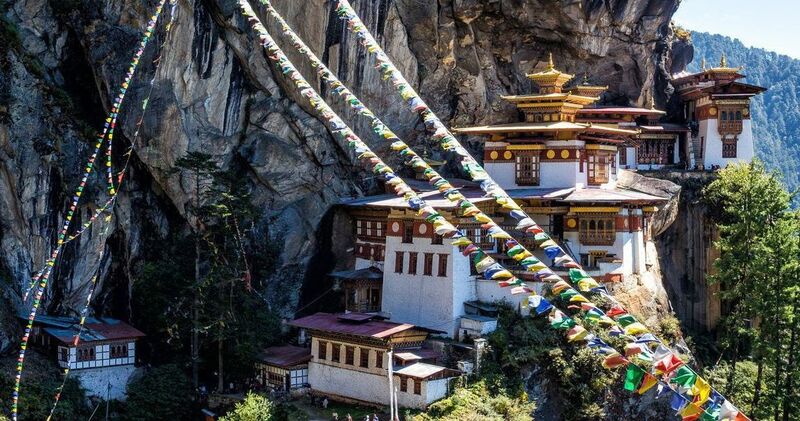 As you hike through the low hanging clouds the world will open you will see Tiger's Nest, sitting on the top of a steep cliff Along the way, you will see Buddhist temples, waterfalls, and hundreds of prayer flags along the trail. This is one of the most sacred sites in the world for Buddhists, As you hike, watch for the Monks as they practice the rituals of Buddhism. In April 2015, a devastating earthquake hit Nepal, killing over 9,000 people. It destroyed national monuments, homes, and villages high in the hillside. As an IMR volunteer, you will join IMR's partnership with local hospitals and medical providers to provide care to patients in the Kathmandu valley and in distant villages who are left out of the health system. Your clinics will give you the opportunity to get to know the people of Nepal outside of the big city. You'll stay in a comfortable guest house in the communities where your patients live, work, go to school, and age in place. You'll care for patients with acute illnesses including respiratory issues, skin rashes and infections, wounds, and common stomach illnesses. You will also care for patients with chronic respiratory issues, hypertension, diabetes, and more. Education is critical for patients with chronic illnesses and very limited access to care. Join us to help care for these resilient people! In Nepal, you will stay in simple accommodations with beds provided for everyone. The accommodations, while not luxurious, are safe, clean, and the best of what this community has to offer. Local foods will be served in Nepal, including the community staple, dal bhat, consisting of rice and lentils with a variety of spices. During your time in Bhutan, you will be staying at comfortable accommodations in the city of Paro, surrounded by colorful buildings lining the streets and many temples to tour. There are too many highlights during this trip to mention them all. You will visit the medieval city of Bhaktapur, including Durbar Square, which was recognized as a UNESCO World Heritage site in 1979. This beautiful and historic city sustained significant damage during the 2015 earthquake, but you will see its resilience as you stroll around centuries-old stupas and temples, many of which are dedicated to Lord Shiva. A trip to the famous Buddhist temple, Swayambhunath, another UNESCO site, lends itself a great vantage point for viewing the city. In Bhutan you will have one full day in Paro and the opportunity to hike up to the famous Tiger's Nest. Weather permitting, enjoy a once-in-a-lifetime tour of Mt. Everest from an aerial perspective as a passenger on a private plane. Get up close and personal as you glide around the awe-inspiring Himalayas. This excursion merits a certificate of honor for your journey after landing. Preceding your trip, plan for an even grander tour of Everest by extending your stay for a trek. Expeditions can range from an exhilarating hike outside of the valley to more adventurous treks up the numerous trailheads accessible to tourists. Even take on the challenge of conquering the journey to Everest's base camp! Ask your in-country host how to add this experience to your trip! YES - We need your help to take IMR supply bags internationally to Nepal and Bhutan! Take 2 supply bags for IMR both ways to Nepal and Bhutan.